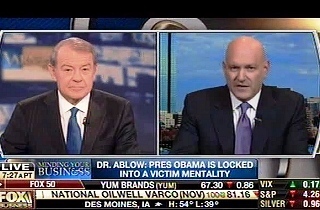 Has Fox’s resident psychiatric “expert” Keith Ablow jumped the shark yet? Short answer: Yes. At this point, he’s definitely wearing water skis and a leather jacket while jumping over a shark. But that shark is in the middle of jumping another shark; and then that other shark is in the process of being swallowed whole by a much larger shark that came out of nowhere. Suffice it to say, the whole thing is very chaotic. Lots of sharks being jumped. Since Ablow would have no reason to mug for the camera otherwise, the answer is: Yes. Obviously. Reiterating his well-worn claim that Obama wants to impose a “victim mentality” on all of America, Ablow rattled off four predictable minutes of psychobabble about how the president believes in food stamps and entitlement programs because he vehemently hates the concept of the “individual.” Ablow also goes as far as to guess (just based on his own assumptions, of course) that Obama despises the very existence of God and thinks it a superstition. Voila! And there you have a cable news segment that informs no one. Look, as a libertarian I oppose a great deal of Obama’s policies, but for crying out loud, Ablow: Find a new shtick. But while we’re all repeating our half-baked diagnoses of other people, I’ve got a diagnosis of my own: Methinks there’s a particular Fox pundit who received very little attention from mommy and daddy as a young boy, and so he seeks to impose that desperate-for-attention attitude upon the rest of America. Someone. Please. Make it stop.